I’ve designed the Leila bridal garter to sit fairly flat on your leg, perfect under a slimmer fitting wedding dress. The drops are 6mm Swarovski pearls with a gorgeous lustre, but the detail isn’t just reserved for the front of the garter, you’ll find the hem is dripping with pearls all the way around, connected with tiny seed beeds in silvery toning shades. Pearl Swarovski flowers with crystal centers adorn the sides of the garter but also the front where I’ve stitched the same flower, this time with elegant guipure leaves also stitched with silvery veins. I love hand sewing and the beading does take me hours to stitch, I hope it makes you feel amazing on your wedding day! 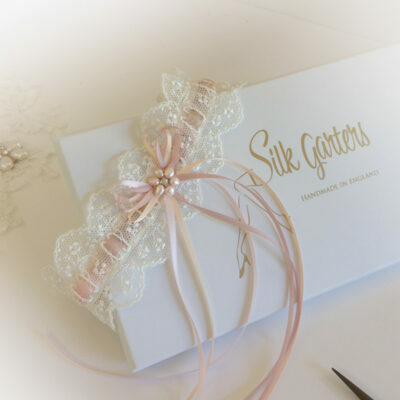 For this bridal garter I’ve chosen a beautifully soft ivory Calais lace with an unusual shaped edge and stitched it with small Swarovski pearls. 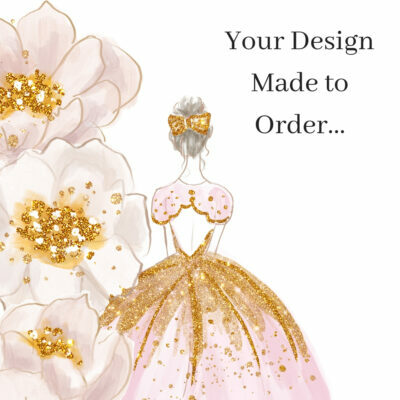 If your dress has beading, this is a perfect accessory! The detail isn’t just reserved for the front of the garter, you’ll find the hem is dripping with pearls all the way around, connected with tiny seed beeds in silvery toning shades. If you’d like your pearls in another colour please let me know, I do have the lovely ‘Luna’ bridal garter where the pearls and seed beads are a delicate light blue. Although Swarovski do have an amazing range of colours available in their pearls if you’re looking for something different.